“Asian Festivals Exchange” puts together works selected from two East Asian festivals — Yokohama Dance Collection and Seoul Dance Collection — two works performed by T.H.E. Second Company, and a work-in-progress supported by M1 CONTACT Contemporary Dance Festival and Seoul Performing Arts Festival. It is a very full evening of dance, and the audience seems generally to leave in a slight daze — a mixture of feeling refreshed, overstimulated, heavy and entertained. As one might be after a lush, rich meal. Transit by Natalie Maria Clark begins the show literally with a breath, several breaths, deep and loud and full. Dancer Goh Jiayin fills the space with the powerful, beautiful energy of her respiratory system at work. She begins turning all of a sudden, like a whirling dervish, perhaps the choreographer’s nod at spiritualism inspiring her piece. The work unfurls quite like a spiritual experience might — one could be transported into a different headspace, hypnotised into a trance-like state, or lulled into sleep. I was personally transfixed but could never fully grasp why. 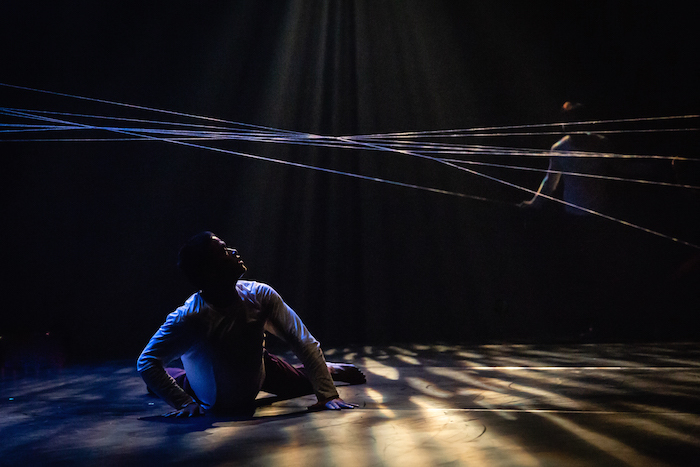 There seemed to be an earthbound force driving the piece forward, as the company built a collective focus, at one point animating a literal web which traps and frees. There are moments of fuzzy softness, as when the dancers snuggle in a neat row, standing front-to-back, head-to-head. This image collapses on a collective out-breath, and they become a wave in the ocean, pebbles on the beach. The choreographer exerts tight control over the visions she creates, while successfully coaxing authentic performances from the company. I wish for some editing of the piece, as the images start to seem packed in, rather than highlighting the ways in which a breath travels through a group. The composition by Indira Force (aka Indi) created the perfect atmosphere, with sounds that suggest the shifting of consciousness — tripping into psychedelic alternative rock, and floating into meditation music. 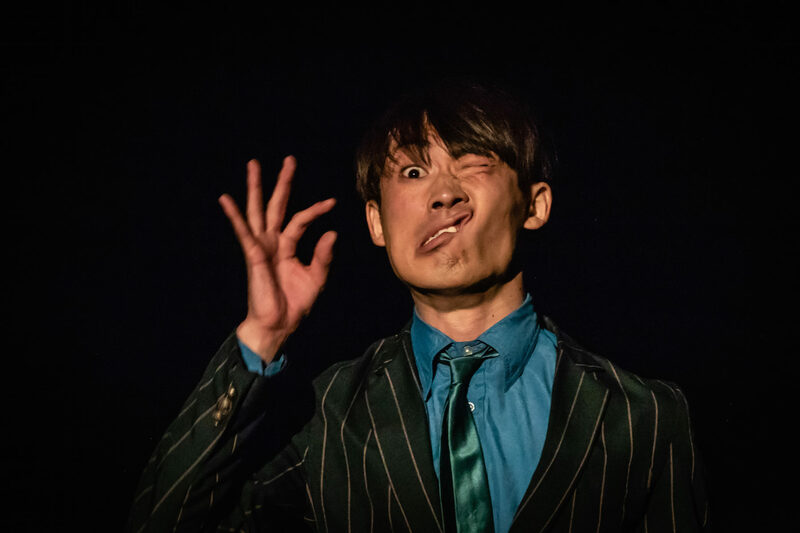 First Abundance Society sees two mildly sardonic persons, Kim Ho-yeon and Lim Jung-ha, attempt to create a perfect, self-contained universe on stage. They almost succeed, in that their ideas layer over each other in ever-creative, ever-surprising ways. Yet we are never allowed to fully be entertained into escapism. There is a plant on stage, they eat its leaves, the theatre smells botanical. There is a video projection of trees behind them: what a strange, disconnected world! Are they desiring a simplicity that could never again be? They get going. When these dancers move, they are crisp and precise, almost cartoonish. They maintain a neutral expression throughout, even when wiping their bums or showing us primitively-drawn, slightly silly things they have sketched on their bodies. They are like the stick figures they have drawn. All action is abstraction, lines and dots forming to create a picture. They eat lemons. They play with their pants. Two men dancing alone together on stage, their chemistry and deep connection undeniable. They eat red peppers, tie themselves in knots, dance with their mouths full of food. They thank the plant when they bow. My attention begins to struggle a little from the density of information and movement detail. Kenji Shinohe, with K(-A-)O, does an amazing job keeping us focused on him and his surprises. He’s dressed in a suit jacket and shorts, a corporatised millennial, his face covered by a piece of paper he holds, saying, (-A-) which is an emoticon I am not familiar with. A search on Wikipedia brings me to guess that it might mean “deflated, snubbed”, “lonely” or “that’s bad”. Shinohe gets very painfully literal in dealing with emoticons and their impact on the expression of inner feelings, to great effect. 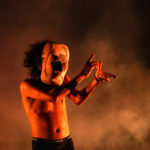 He uses a phone playing video to cover parts of his face, and changes his expression based on each video clip’s shift, to the audience’s great joy. I could watch him transform his face mechanically, all day long. Such virtuosity, to be able to express so many different things in such a short span of time! But we know it is all without true connection, and the hilarity comes with a tinge of heaviness. The man unravels, lost in dancing many different gestures and actions without obvious logic. He goes to the audience, wildly desperate, seeking a connection he will not find from breaking the fourth wall. It is the comedy of a sad clown. Kim Bora’s The Seasons is quietly satisfying, a patient spirit revealing its inner richness. It remains as enigmatic as celestial creatures — four stalking, strutting females, and a single male, the “Golden Dragon”. Drawing from East Asian mythology and balancing the visual impact of video projection by Lim Jungeun, the piece quickly absorbs the audience in simple, nuanced movement. A curve of the neck, a slight contraction of the chest. Beams of light follow the music, the performers sustaining an imaginary space, a mystical presence, in perfect balance beyond the usual razzle-dazzle of technological display. Dressed distinctly by designer Choi In Sook, the dancers each hold a single, long feather, a costume decoration which dances along to their twitching. I am uncertain about its reference; it suggests the influence of Peking Opera to me. The delicacy and sensitivity of the object highlights the subtlety of each small movement. Sometimes the celestial beings, imaginary animals, are like dumb pigeons – cooing heard in the soundscore as they bob about knock-kneed. The work ends as mysteriously as it begins – the “Golden Dragon” embodied in the leopard-like Shawn Tey gathers the feathers and the women remove their socks to leave a trail for him. He follows the trail with beautiful seriousness. The feathers drop, the lights fade out to the sound of chirping. There was a story here, but it is the quiet experience of being in the present that really matters. I am quite persuaded that T.H.E. 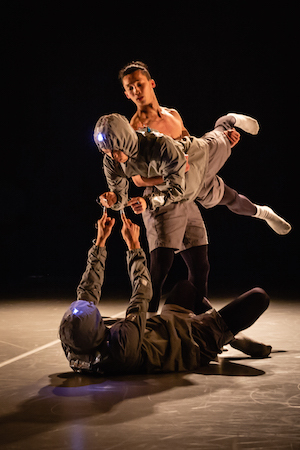 Second Company is an alternative vision to the main company, more so than a semi-professional group — they are a team of able and imaginative performers helmed by Associate Artistic Director Silvia Yong. To close the evening, almost as an addendum, we witness a work-in-progress showing of Ignoramus, where the festivals make a clear exchange. Two festivals pair artists to work together — in this case Hwa Wei-An with Kim Ho-yeon and Lim Jung-ha (who made First Abundance Society). 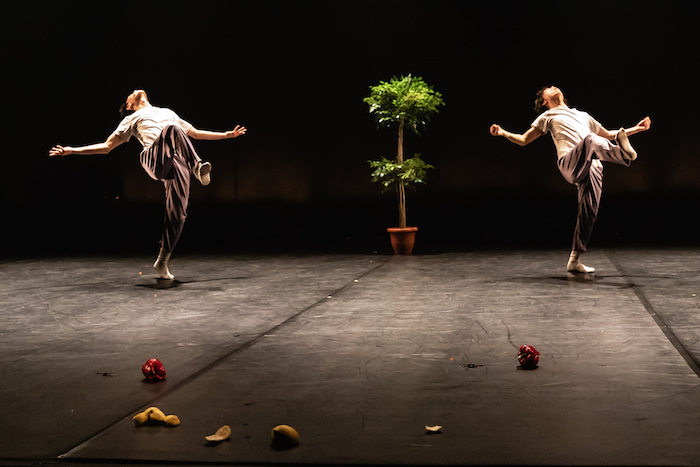 The partnership is perfect: they have similarly awkward, comical mannerisms, their urban dance references overlap, and seem to share an interest in philosophical rumination while making dance. The Koreans have built and put on a simple contraption fitted to their fingertips and bodies, emitting light and sound when they make contact through those electrodes. This provides the sound score and lighting design, as well as a silly sense of timing. I enjoy the sense of immediacy provided by smells and objects in the space, with a microwave being set off, a phone revealing a countdown at one point (why? to what? ), the melting object being removed from the microwave. I feel like the ignoramus at the end — just like them, bumbling along, doing “cool” virtuosic tricks, dancing densely-packed movement connections, pressing buttons on the microwave. It’s all the same, it seems. 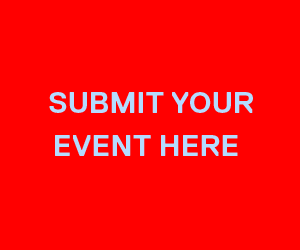 Perhaps “Asian Festivals Exchange” would need a name change soon: if future iterations are to specifically partner East Asian festivals, or if partners might come from the Pacific region, or if the “Asia-Pacific” is going to shift to being popularly known as the “Indo-Pacific” or “Indo-Pacific Asia” — or something else. Might there continue to be a need to delineate parts of the world? Might we redraw the lines? I eagerly anticipate the development and explosion of dance in this part of the world, following on from the prospering of nations, the recognition of a need, still, for dance within our hectic 21st-century pace. 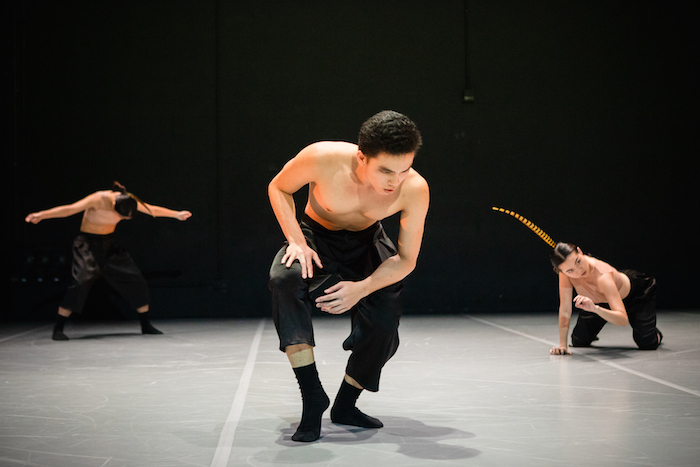 Asian Festivals Exchange 2018 took place 31 Jul – 1 Aug at Esplanade Theatre Studio as part of M1 Contact Contemporary Dance Festival. Guest contributor Bernice Lee is a dance artist whose love for language is in its kinetic, felt sense. She sees writing about performance as its own artistic medium, contributing her voice to building positions and perspectives over time. Visit her website here.